The desire to write, and to learn about writing, continues to be a welcome and growing phenomenon here. 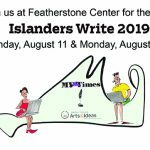 As a testament to this fact, several hundred wordsmiths and wannabes packed the Grange Hall in West Tisbury for more than nine hours on Monday at the second Islanders Write (IW) conference, sponsored by Martha’s Vineyard Arts & Ideas magazine and the MVTimes. 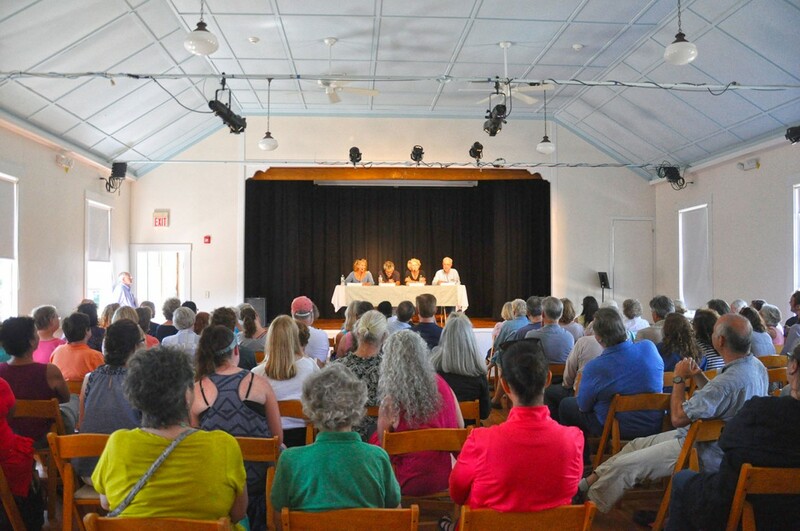 The event was co-sponsored by the Noepe Center for Literary Arts in Edgartown, Cape and Islands public radio station WCAI (90.1 FM) based in Woods Hole, and Bunch of Grapes Bookstore in Vineyard Haven. Rosewater Market had breakfast treats and sandwiches, while Chilmark Coffee Co. donated coffee to a grateful early-morning crowd. 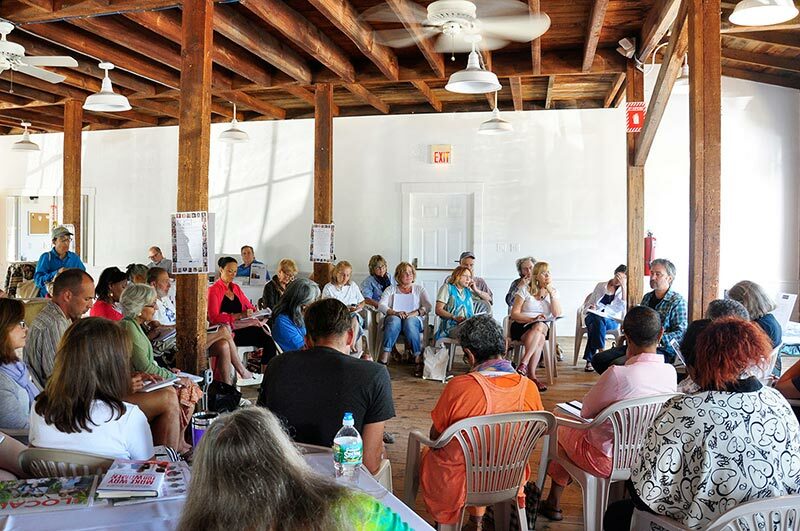 Attendees took full advantage of eight interactive panels and five workshops designed to provide learnings on the art and the craft of writing, in genres ranging from fiction and screenwriting to writing humor and music. Several of the panels offered informed looks at the strategic and business side of getting published, and every session included a question and answer period that often extended beyond the allotted time, as participants were eager for more. The Noepe Center sponsored four workshops, including one with Noepe founder Justin Ahren on establishing a daily writing practice; a session with Niki Patton on her Writers Read project, in which authors read their work aloud to others; and workshops with Susan Klein on organizing and writing memoirs and with author Michael West on finding inspiration. Attendee Laura Reiter had to take a breather around noon. “Tired? I’m exhausted. There is so much here. I have so many questions,” said Ms. Reiter, who traveled from Falmouth for IW 2015. Fortunately, she was standing by the main hall in which authors and panelists were gathered, talking with attendees and answering questions. About half the authors were signing and selling newly published books. Inside the hall was Terah Young, an emergency room seasonal intern at the Martha’s Vineyard Hospital. Ms. Young, a Phoenix, Ariz., native, brought her parents and sister to IW 2015. They watched Ms. Young in an animated conversation with panelist John Sundman, an author and old hand at the intricacies of self-publishing. Ms. Young’s passion for writing includes an ongoing blog and plans for a book. “I write three times a week, and always on Friday. I call it Fabulous Friday,” she said. Writing is personal for Ms. Young, who is battling ovarian cancer for the second time. “I want to share and to inform people, and it’s great therapy,” she smiled. “What have I learned? First, I have to get an agent. Second, I need to write every day. This is an amazing opportunity to learn. I’m coming back to the Island next summer, and I’m coming back to this [event],” she said. Ms. Young’s story offers an insight into the commitment many attendees brought to the event. For some, there is a desire to write a memoir to help themselves and others understand the people and life events that are important to them. Others are committed, finally, to scratching a decades-old writing itch. For the people we talked to, the urge to write is based on a need to communicate and understand, and their attendance at IW was part of the process of obtaining the necessary tools to help them get there. For example, the opening panel was about self-publishing, long the red-headed stepchild of publishing. 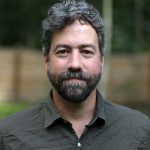 But moderator Michael West opened with an intonation of self-published authors: Proust, Hemingway, Twain, Hawthorne — a dozen legendary names who did it, including Stephen King and John Grisham, who have left conventional publishing to do it themselves. Panelists John Sundman, Katherine Scheidler, and Amy Reece provided a bucketful of tips and resources for self-publishing novices, including the need to manage technology and social platforms and to involve professionals in the making of a book. “Martha’s Vineyard is a mecca for resources,” Ms. Scheidler said. She and Ms. Reece observed that illustrators like Heather Goff, writing coaches like Holly Nadler and website auditor Laurie Jones have sharpened author focus on the creative and business side of publishing. Ms. Scheidler noted that writers must develop an aggressive attitude to nurture their creative foundlings. “Be obnoxious, persistent,” she said. Panelists agreed that self-publishing online resources have come of age, touting Smashwords, Ibook, Xpress, and Book Architecture as good learning sites. Mr. West recommended a read through “Self-Publisher’s Legal Handbook” by Helen Sedwick to understand the business side of publishing. 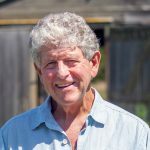 Self-published books can be up and marketed on Amazon in one day, he said, noting that books should always be priced at $2.99 or higher, “You get 70 percent on prices at $2.99 and 30 percent below that,” he said. Additional publishing nuts-and-bolts advice came from a panel on the business of publishing. Successful agent Rosemary Stimola; Dawn Davis, a vice president at Simon and Schuster and at Random House; and Jamie Raab, CEO of Grand Central Publishing, a Hachette Books imprint; joined A-list author Tony Horwitz to contribute bottom-line advice. Panels presented distinct and different personalities, nowhere more evident than in the back-to-back sessions on Writing for Laughs and Writing a Screenplay. 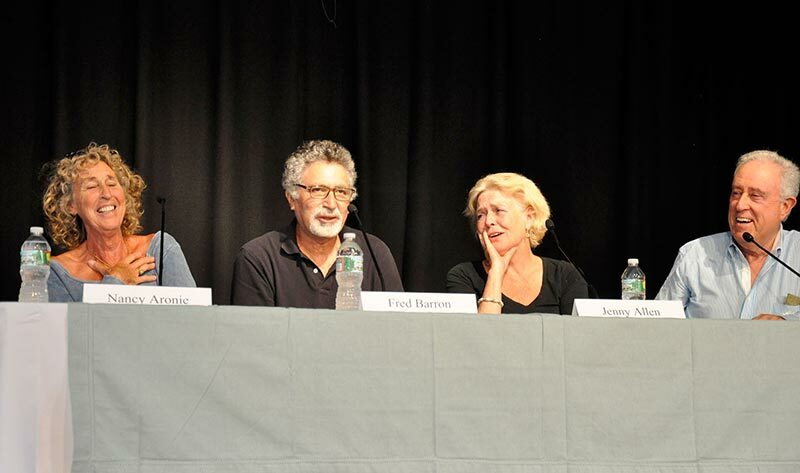 The humor session was a nonstop hoot, sort of managed by moderator Arnie Reisman, charged with herding madcaps like the New Yorker’s Jenny Allen, Seinfeld executive producer Fred Barron, and Chilmark wag and writing coach Nancy Aronie. The Writing a Screenplay panel might have been subtitled How to Swim With Sharks, as successful survivors Sarah Kernochan, Lucy Dahl, and Amy Holden Jones joined moderator Lawrence Blume for a primer on navigating the often-shifting sands of Hollywood and television screenwriting. The panelists, particularly Amy Holden Jones, did not pull their punches in describing the cinema noir of screenwriting. Among the more interesting comparisons between genres are the similarities between writing poetry and writing music. It makes sense when you think about it, but our perceptions are that poets are ascetic and angstful and music writers are hard-drinking public performers. Turns out there’s angst for all in both camps, and their creative methodologies are strikingly similar. Chilmark resident Connie Williams hadn’t planned to attend IW 2015, but had a eureka moment, and was glad her guest Roz Anderson-Flood talked her into it. Ms. Williams emerged from the Developing Character and Voice panel rhapsodizing about her new knowledge. Ms. Williams referred to the comments offered by author and moderator Geraldine Brooks, Nicole Gallant, and LaShonda Katrice Barnett, all writers of historical fiction who use ancient court records and correspondence as a way to bring life to characters from antiquity. Mr. Ahren’s workshop had doubled in participants from the 2014 event, and he was in awe. “I still can’t get over it. The intensity. How passionate people are about writing. It hasn’t diminished at all from last year,” he said. A refreshed Ms. Reiter pronounced the event a success, and it seemed the sentiment was shared by many. “It should be two days next year. There’s so much here,” said Ms. Reiter. As promised here are some nuggets of wisdom and comments overheard at IW 2015 that may be helpful, cautionary, or amusing. The entries are listed by event topic. “I can’t convince songs to come, but when I write regularly, I’m fully prepared when they show up.” — Willy Mason.